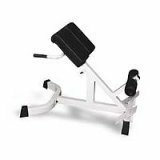 The 45 degree hyperextension board can also be used as abdominal exercise equipment. The hyperextension board is most commonly used to perform lower back strengthening exercises, but if you turn your body sideways you can do abdominal oblique exercises. Below are 2 variations of an ab exercise for your obliques. Starting Position: Turn sideways on the 45 degree board and plant your feet so they are secure against the supports at the bottom of the machine. Form: With your top hand on your hip and your bottom hand pointing towards the floor, slowly bend towards the floor allowing your bottom hand to reach towards the floor. Continue bending until you feel a good stretch in the top oblique muscles. Hold for a brief second and then return to the starting position. 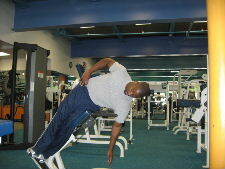 Personal Trainer Tips: Do your best to keep your body in a straight line and move in a controlled manner. You can keep your feet stacked one on top of the other or staggered. Use the foot placement that is most comfortable. Perform 8-15 repetitions before switching sides. Starting Position: This exercise begins just like the above exercise. The only difference is that you place your hands behind your head. Form: Inhale and slowly lower your body towards the floor. Hold for a brief second at the bottom and then return to the starting position. Personal Trainer Tips: Begin with the first variation of this exercise and as you get stronger progress to this variation. This is a tough oblique exercise, so listen to your body. 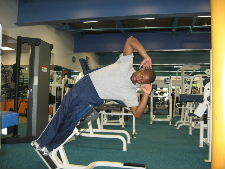 In addition to the abdominal obliques the lower back muscles also work during this exercise. If you are a beginner progress slowly. Even one set of 10 repetitions could leave your sides sore for a couple of days if you have never done this exercise before. The 45 degree slant board is actually an ab machine and back exercise machine that I really like and think it has many benefits. In yoga it is often said that it is important to exercise your spine in all directions. 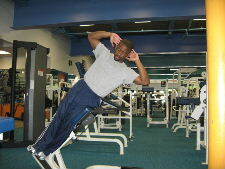 Side Bending or side support is sometimes a neglected motion in ab workouts. 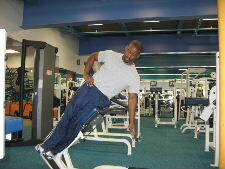 In addition to moving forwards and backwards during ab exercises, it is also important to move side to side. Exercising in all direction can help to keep the lower back healthy and can improve every day function and athletic performance. 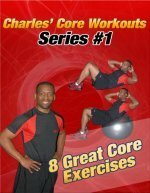 If you don't have access to this abdominal exercise equipment, you can try regular isometric side planks or moving side planks to work your obliques and lower back. Remember to listen to your body and train your spine in all directions.